VIGF is offering a limited number of tickets on a first come first served basis. Email info@vancouverguitarfestival.com to register. Please identify which class you want to attend. Grit Laskin is the recipient of Canada’s highest civilian honour, the Order of Canada. He is the first and only musical instrument maker to receive Canada’s most prestigious national craft award, the Saidye Bronfman Award for Excellence. He is a founder of the Association of Stringed Instrument Artisans (ASIA) and author of the first code of ethics for the luthier’s trade. He is also an elected fellow of the Royal Canadian Academy of the Arts, and included both in the University Of Toronto’s “Who’s Who In Canada” as well as the Encyclopedia of Music In Canada. Most recently he received the Estelle Klein (lifetime achievement) Award, from the Ontario Council of Folk Festivals. 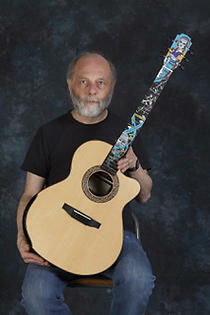 In addition to building extraordinary sounding guitars, Laskin uses them as “canvases” for his engraved inlay art. He is internationally acknowledged as having single-handedly taken the tradition of musical instrument decoration beyond the purely decorative. For Laskin, the inlay medium has become a tool for communication, not merely embellishment.